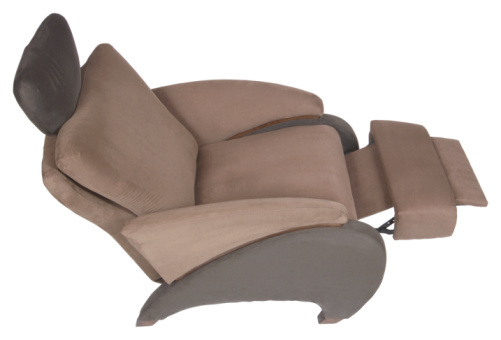 Many recliner models feature a swivel function that lets the user rotate the chair using his feet. This feature is useful for changing the direction of the chair. Disabling the swivel function stops the chair turning, leaving only the recliner and footrest active. You might want to disable the swivel if the chair is close enough to knock nearby furniture like side tables and bookcases. The process involves adding screws to the base of the chair. The instructions may vary depending on your precise model of recliner. Stop your recliner swivelling by adjusting screws on the base. Turn over the recliner so the base faces upward. Ask a friend or help if necessary. Spin the base of the chair so that the holes on the swivel base line up with holes on the base of the chair. Place spacer bushings, if necessary, in the space between the holes. Pass screws through the holes in the swivel base, through the spacer bushings and into the recliner base and tighten. Turn the chair upright. The swivel function is disabled.